We are committed to a safety culture and vigilant approach to safe operations, helping to minimise the risk of accidents and ensuring that no one is harmed or subject to unnecessary risk whilst working. We are committed to the continuous improvement of our safety management systems and procedures, which are updated regularly to meet environmental changes and industry legislation. We have a customer-centric approach to business. Our focus is to consistently develop new and innovative ways of working, making valuable contributions to the needs of our customers. We are committed to creating confidence through relationships and reliability and making a promise that delivers exceptional service. We are committed to managing resources smartly and are focused on activities that create value. We conduct our operations effectively through delivering projects using appropriate costs, speed and quality and using good decision making. Our ethos is to be accountable for consistent execution and use proactive integration and collaboration for better solutions. We are driven by our ‘quality ethos’ and the continuous improvement of our quality procedures, systems, work instructions, specifications and methods, which are approved and certified to BS EN ISO 9001:2008. Our measurement of quality is backed up by continual employee training and the development and quality focus of our employees and customers. Our aim is to continuously strive to exceed our customers’ expectations and deliver an exceptional quality of service. We carry out our operations ethically and area focused on achieving growth whilst safeguarding the environment. We understand that the long-term well-being of society, the well-being of our employees, the strength of the economy, and the continuing success of our own business depend on our commitment to a sustainable environment. 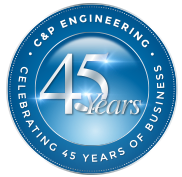 C&P is committed to integrating environmentally friendly policies and practices into our organization by operating in a manner that promotes energy and materials conservation, as well as waste reduction. We are focused on fostering an environment where people are able collaborate to develop innovative ideas and optimal solutions, with a focus on cooperatively achieving common goals. Teamwork respects diversity and values the power of team interaction, recommendations and decisions.